An RTL-SDR V3 dongle. This dongle includes a bias tee which is required for powering the LNA’s or active antennas, and is improved so that L-Band reception is much more stable. Cost: $20.95 USD. An Outernet Patch antenna. This antenna is designed for receiving L-band signals and does a very good job at it. Cost: $29.99 USD. Note that generic R820T2 dongles may not receive well above 1.5 GHz if the ambient temperature is too hot – fair warning that RX can be hit or miss at these frequencies. We tested some generic dongles at an ambient temperature of 16 degrees and it worked well, but when run in direct sunlight the RX eventually failed after 30 – 60 minutes. The E4000 should work better at L band frequencies but these tuners are rare and expensive now. 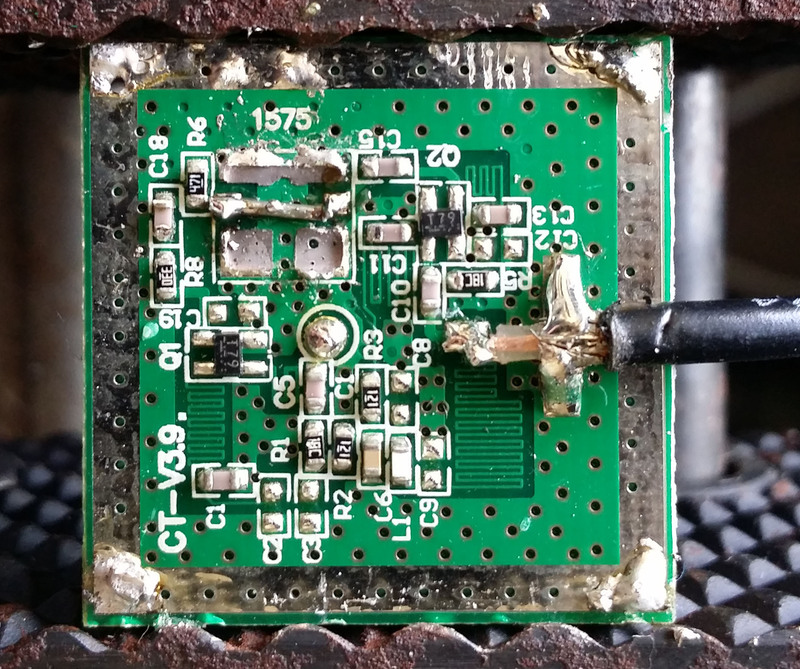 NOTE that our RTL-SDR V3 does NOT have this problem thanks to its passive cooling and improved thermal design. If you have an Airspy SDR then this is even better (it has good RX at L band frequencies and has a bias tee). The HackRF and SDRPlay should also work, but note that the SDRPlay has no bias tee. Antennas: An L-band patch antenna with 1 – 2 Low Noise Amplifiers (LNA’s), a Helix antenna OR a modified GPS active antenna. We tested two antennas, one was an air gap L-band patch antenna supplied by Outernet which was used together with one or two 15 dB LNA’s. The second antenna was a modified active GPS antenna. Both worked well, with the Outernet air gap patch antenna being better. GPS (low SNR): You can use a $3 – 10 shipped, 28 – 30 dB gain modified GPS active antenna. We show you how to modify such an antenna at the end of this post. Note that RX with this antenna is just on the edge of being able to decode the signal properly, but at this price it may be worth a shot. Also note that you will need a bias tee, or bias tee compatible dongle to power a GPS antenna. Patch (medium SNR): The Outernet patch antenna is now for sale on Amazon and on their store. This is the patch we recommend using and it is quite cheap too. 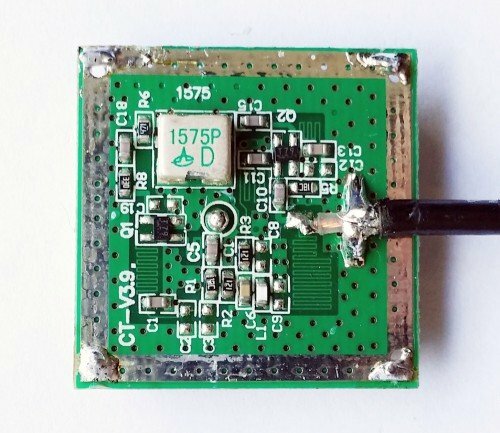 If using a patch antenna like the Outernet one, then you will probably need about 15-30 dB’s of total amplifier gain which is supplied by one or two LNA’s. If a short cable run is used 15 dB should be enough, if a longer coax run is used 30 dB may be needed. Alternative patch antennas that might work include discarded L band devices such as WorldSpace antennas. Also see our new post for information from Adam 9A4QV on dimensions for building a home made patch antenna. LNA’s: We highly recommend using the Outernet LNA. This LNA is designed for these frequencies and also has built in filtering. The pricing is also very good at only $19.99 USD. Note that to use this LNA you will need a dongle with a bias tee, such as our RTL-SDR V3, or an external bias tee unit. As a second choice Adam’s LNA4ALL should also work decently, but in our experience the L-Band SNR is not as good as with the Outernet LNA. Other similar LNA’s should also work, but they may not be designed as well as the LNA4ALL, which can cause problems at the high L-band frequencies. 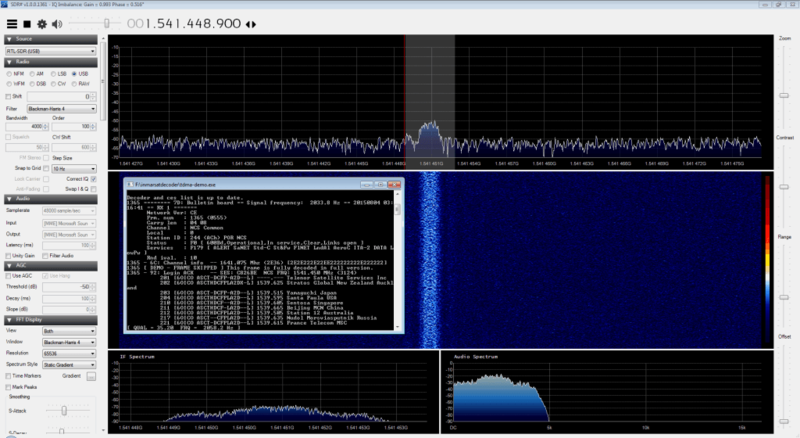 Software: The demo (or paid) version of the Inmarsat decoder from inmarsatdecoder.com. Note that Chrome and many virus detectors class this website and software as a virus, but we believe that it is a false positive. If you don’t want to risk it then an alternative with similar functions is the Tekmanoid Java based STD-C EGC decoder, but we note the first decoder appears to work much better, especially with low SNR. Audio Piping: You will also need to have installed SDR# or similar and Audio piping software like Virtual Audio Cable, VB Cable, or have enabled stereo mix. The Outernet L band patch antenna is based on air gap dielectric patch antenna designs which have higher gains than ceramic patches (like the smaller ones used in the active GPS antennas). Here is what the prototype they sent us looks like. It has a VSWR of about 1.1 at 1.5 GHz and 1.45 at 1.56 GHz. 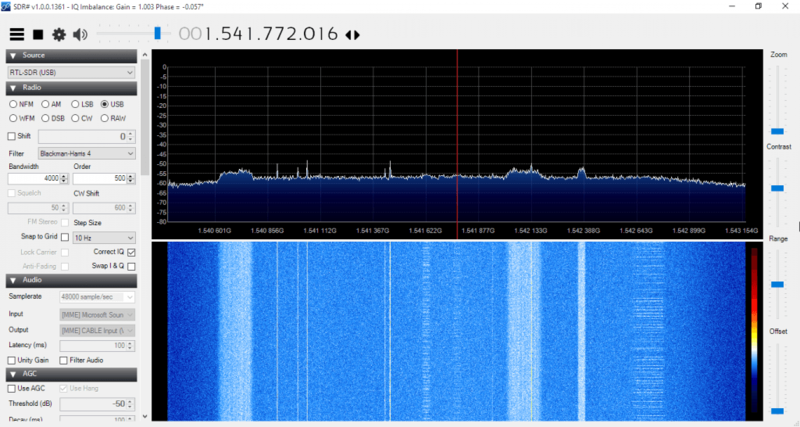 Start SDR# and tune to 1.541450 GHz. You should see a thin signal that is about 2.5 kHz in bandwidth, this is the STD-C NCS channel. Since the signal is right hand circularly polarized (RHCP) you might try rotating the antenna you are using for best reception. Note that if you don’t have a TCXO dongle then the frequency may drift significantly for the first half hour or so. Even with a TCXO a 1 PPM temperature drift at 1.5 GHz is 1.5 kHz which can be large enough to cause enough trouble with decoding a 2.5 kHz narrowband signal like this. We recommend waiting long enough for the temperature drift to settle before tuning, probably a couple of minutes with a TCXO dongle and possibly over 30 minutes for a non-TCXO oscillator dongle. After the inmarsatdecoder program gets a lock it will continue to track the signal for drifts of about 500 Hz. 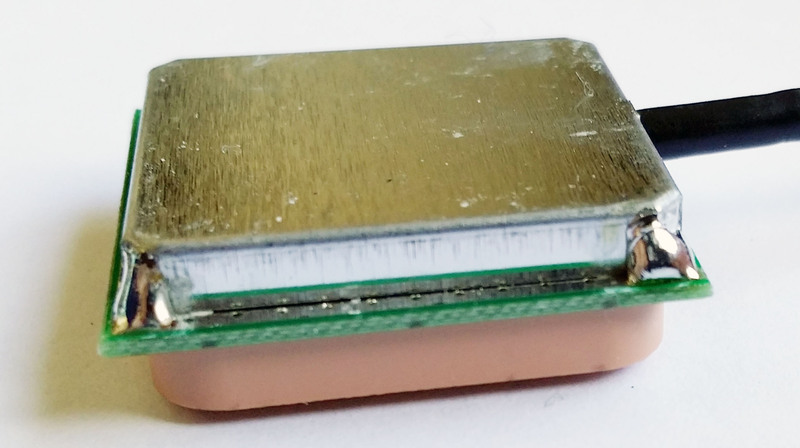 A cheap $10 USD active GPS antenna can be modified for Inmarsat reception (though we need to note that it is not a particular good antenna, but it should be enough for STD-C NCS). Note that GPS antennas are active (as in require DC power), so you will need an external bias tee module, or an SDR with a bias tee option, such as our dongles. 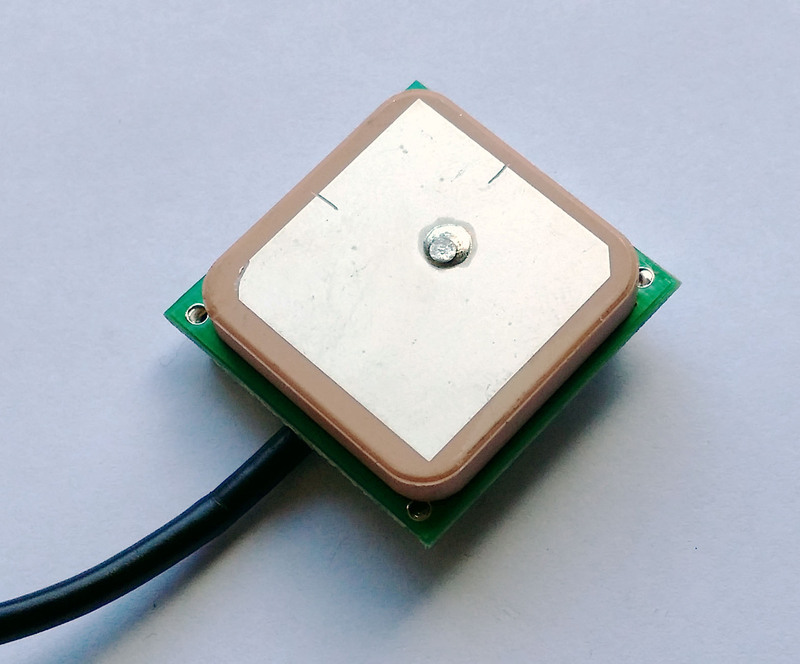 Active GPS antennas contain a ceramic patch antenna, LNA and bandpass filter which is tuned for 1575 MHz. The bandpass filter prevents reception from signals more than 1-2 MHz away from 1575 MHz. All that is needed to modify a GPS antenna for wide band reception is for the bandpass filter to be removed. Below we show how this is done on a cheap GPS antenna that we bought. Update: It turns out that not all GPS antennas have a bandpass filter installed. Many very cheap GPS antennas simply don’t have one installed as a cost cutting measure. These ones without filters should be good to go for Inmarsat already. Many GPS antennas will also look different on the inside with different shaped filters used. Inside the antenna case. A ceramic patch antenna. Reflector on the back of the GPS antenna. Soldered down at the four corners. Now with the filter removed, bridge together the IN and OUT filter pads by soldering on a wire or 100 pF capacitor. These are usually the pads in the center of the filter. If the pads got completely removed when you ripped off the filter, then you can still bridge the gap by soldering to the connected components. NOTE: Not all GPS antennas are the same! Some may have smaller looking filters (it seems that some don’t even have filters and require no modification, though those seem to be rare) and some may require a capacitive bridge instead of a wire bridge. See Adams video for an explanation. If the filter is connected directly between the two amplification transistors (no capacitor block already in place) then you should use a ~100pF capacitor instead of a wire bridge. Now solder back on the reflector and put the whole thing back into the plastic case and your done! You may also want to experiment with reducing the length of the lossy RG-174 coax used on most cheap active GPS antennas, or with instead using lower loss coax like RG6. The GPS antenna is not as good as the dedicated L-band patch antenna with LNA(s), but it was still good enough to decode the signal. See below for a waterfall comparison between the two antennas. Mouse over to see the GPS antenna waterfall. The STD-C NCS channel is the first thin line to the left of the red tuning bar. In this setup we used two LNA’s on the Outernet patch antenna, and 3M of extension RG174 (RG174 is very bad at L-band frequencies which is why we needed to use two LNA’s, if you use RG6 cabling or similar then only one LNA should be needed). Without the extension cable only one LNA was needed for similar SNR levels. The GPS antenna used the 3M of RG174 coax that it came with. You can also improve the reception with a GPS antenna by placing it on a large metallic surface, like a cookie tin. Using the metallic surface may be the difference between getting decodes and not. L Band reception with the air gap patch antenna, two LNA’s and 3M of RG-174 coax. Mouse over to see how the waterfall looks with the GPS antenna. What else is at L Band? There are many signals at L band frequencies coming from Inmarsat and other satellites like Iridium. You may be interested in Iridium pager decoding which occurs at 1.626 GHz. Some YouTube talks and links about decoding Iridium can be found here and here, plus notes by a user on our forum here. If you are refering to the Tekmanoid decoder, then the SIGNAL really needs to be 80% minimum and the QUALITY needs to be 100%. Out if interest. What’s the smaller dish I could use that’s not off center. Difficult to say, it depends on where you are in relation to the satellite. Some people in Europe for example, simply place the patch antenna on their window sill. I’m some 40,000 Km away from the nearest Sat so i need the 1M dish. You will need to run an LNA for best results. I’m running the patch antenna on a 1m dish and i get no decodable L band signals without one. They make all the difference. 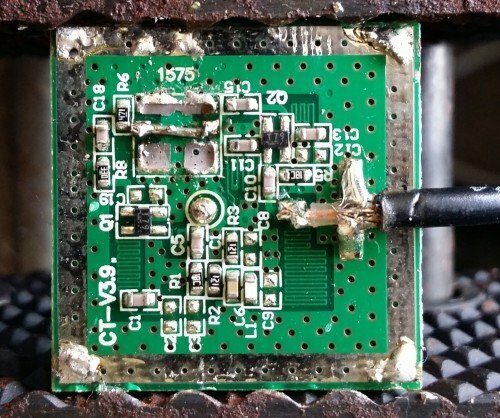 When modifying the GPS antenna could you simply bridge the bandpass filter with a couple of wires/capacitors, or do you really need to unsolder and or destroy the filter chip? 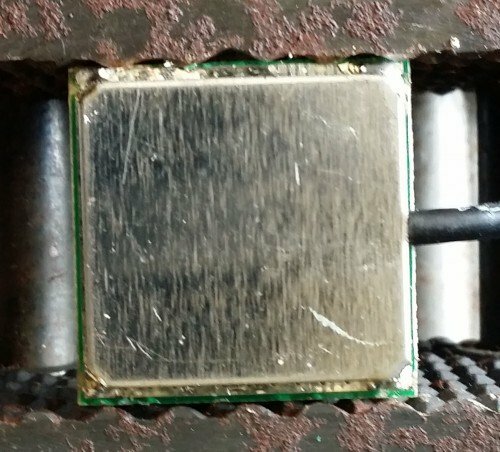 Perhaps do you know what its about this gps-pcb (cirocomm 580). Especially the Y1 marked component (is it a crystal?, but for what, i cant see an ic?). Can I use it like that or is there any Function to Filter with this oscillator(Timer or what ever)? i want built a inmarsat dish antenna – now i look for the best solution – shold i use a Helix or a Outernet patch? 99.999% of all this “OuterNet” stuff is pure B.S. These guys send folks off on snipe hunts. Load this, run this, gotta have this hardware, nope that hardware has been deprecated, need THIS new hardware from our store, now you need all this new software and don’t forget to load these images and let’s not forget all the changed satellites, nope not using that one anymore, gotta use this one, and BTW it requires all THIS new hardware and software. Let’s not forget about all the damn virii in all these software installs. SNIPE hunting for wiper fluid, from luxury-class douchebags. I might be wrong, but i guess you gotta remove this big element with “1575P” written on it, and bridge some pads. Just look at the guide, seems to be the same one. I have an excellent signal on L band, and am trying to decode the Sat C messages. I am using both TDMA-DEMO and the Java app Tekmanoid. To say it’s frustrating is an understatement. The TDMA-DEMO app decodes the first frames of many messages, but the Tekmanoid just shows the frames but no EGC messages. I am interested how the author of this article was able to decode the EGC messages. Incidentally I can decode Inmarsat Aero easily. Am succesfully runnuing piAware on an RTL-SDR stick, and am active in the FlightAware forums, so know a little bit about this area. Never done anything with satellite or SDR# like this though. I (believe) succesfully removed and bridged the filter from the GPS antenna. However, when I tried to follow the tutorial re SDR#, even though I followed each step and matched the settings shown in the screen grab, my frequency graph looked nothing like that shown above. Interestingly, JAERO got to the stage where it had a green light on both Volume and Signal, but never got any data – the java tool above also showed activity in the “volume” area, but never got any data. I apreciate a blog post like this may not be the ideal place for a full discussion – are there any appropriate forums for such a discussion / support / to get involved with? I share Bill’s frustration. Can’t get the Tekmanoid program to work, seems there is no option to select the sound card for piping in the audio. The other software, when attempting to download has some severe warnings, sort of like a software armageddon if downloaded. Oh well, maybe it’s me, will keep trying. Great post though. You can usually set the audio source, in Windows, from the Mixer application. It usually has the recording device options , so if you do have Virtual Cable installed it should show as a source . Thank god for these posts! I thought I was going nuts! I have been trying to find info on this program, and the virus. is it possible to buy the full version(Happy to pay even double) How , Where, Who?????? I’m Handicapped and in a wheel chair and this is a important hobby for me. Any info on sucsessfully down loading std c decoder would be greatly appreciated!!!!! Thank You! Bill. Great great article. A few things that might help when building that RHP helical. First off, a spray can of Febreze has the exact diameter needed for making the coil. Next, if you get some plastic straws (I used at least 2) and make holes in the straws (I used a heated wire to melt the holes) at the correct spacing, you can thread the straws through the coil to stabilize the windings. Then you can epoxy the coil at the holes in the straw for a strong fit. For the counterpoise (ground plane) I got a 1 x 1 foot piece of galvanized sheet metal at Home Depot and cut it to size. My plan is to use the RHP antenna and a 1 meter satellite dish aimed at 15.4W (Inmarsat F2). Coincidentally, Telstar 12 is a FTA Ku band satellite at 15W, so the plan is to first find that and I should be near F2. Just a note, Invacomm makes a LNB for both linear and circular polarization, the QPH-031 which has outputs for both linear and circular polarization, but as per the specs the output frequency is only up to 1.45 GHz. However it is worth a try to see if it will work. Again a great article, thanks! With the demo decoder, what can one see? Only the header info, or possibly the full message, like the many shown in the 1st post and then in the tutorial post. I think I need the paid version of the decoder to see all of the message. If so, probably the demo is good enough for me. With the demo (and alternative mentioned) you can see full public safety broadcast messages, like the ones shown in the article. You just cannot see the private messages. Thanks about what I can copy. I live on west coast of Southern California. I’m thinking Inmarsat 4-F3 would be an easy aim, for its azimuth is about 150 degrees and elevation about 45 degrees. Am I correct? what if you put the GPS antenna in the focus of an satellite dish? This should give a plenty amount of power to the antenna. You have to try the real distance / focus where to place the GPS patch thing. – tell me the link to download? Full version for personal use is available for 100€. Yes see the explanation in the article under the software heading. We believe the virus detection is a false positive. You can talk to other users of the software and the author on #hearsat on starchat IRC who will verify that it is clean. But if you don’t want to risk it then use the alternative, but the alternative is not as good. Too many false positives on so many vendors. Perhaps their utility is developed. I can’t get Windows 7 to let me run the .exe file. It say “this file may have a virus in it” (or something similar) and removes it. I think Inmarsat doesn’t want us to have it anymore. Is there a workaround other than the other decoder mentioned? Have you actually been successful in doing what you suggest for this particular file: tdma-demo.exe? When I used tdma-demo.exe I had to un-quarantine the file and then add it as an allowed item in Microsoft Security Essentials (the default Windows AV). The steps depend on what antivirus you use. Well, I got the decoder running by making 2 exceptions, one in the the Firewall and one in Security Essentials. And I do have have Stereo Mix in PC, so it’s on to the next step. I tell you, it’s sure scarry seeing the .exe being deleted over and over without the exclusions. Makes you want to quit the whole project!